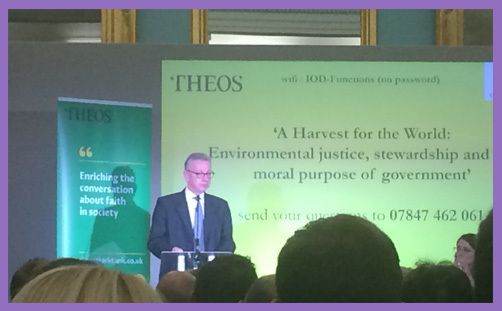 Michael Gove delivered this year’s Theos annual lecture last night, and his subject was environmental justice, stewardship and the moral purpose of government. The whole lecture is well worth reading, not least because it is probably the most overtly Christian speech made by any senior British politician since Margaret Thatcher delivered her ‘Sermon on the Mound‘ to the General Assembly of the Church of Scotland in 1988. In that speech she declared unashamedly that she was “speaking personally as a Christian”. She didn’t couch her faith in milky spiritual platitudes or half-apologise for her profound Christian convictions; she went for the blood-red meat. “Christianity is about spiritual redemption, not social reform,” she proclaimed – to a gathering of senior Christian leaders and theologians – before she proceeded to expound to them the “distinctive marks of Christianity”. The General Assembly of the Church of Scotland are still reeling from their encounter with theo-political greatness. Senior politicians just don’t do this any more, and they haven’t since… well, probably since atheist Alastair Campbell interrupted Tony Blair 15 years ago when he was asked about his faith. “We don’t do God,” snapped Mr Campbell to the poor interviewer. “I’m sorry. We don’t do God,” he reiterated, not remotely sorry at all. And since then no senior British politician has dared to do God, mostly for fear of being harangued on Twitter by the National Secular Society. “You talk about [religion] in our system and, frankly, people do think you’re a nutter,” said Tony Blair. …as a Christian I recognise that we are all flawed individuals in a fallen world, prone to error and arrogance, and any attempt to arrogate to ourselves the mandate of heaven for our actions would be the height of hubris and brittle folly. Jesus casts himself as he speaks as a good shepherd – caring for his flock through all vicissitudes, and bringing them to a life more abundant through a time of trial. …For Christians, the ethical responsibility we have towards the environment is encapsulated in the concept of stewardship. Christians are called to remember their rightful place within Creation – and the vast web of life it created – and their responsibility to protect and defend it. …Laudato Si was how St Francis sought to honour God in his famous religious song, the Canticle of the Creatures, also known as the Canticle of the Sun. In this, he expresses the desire that man and nature should be one – sharing a love of the earth and all God’s creatures in it. Written near the end of his life, around 1225, it is familiar to Anglican congregations as the source of the words to the joyful hymn, All Creatures of our God and King. Significantly, the creatures in question are not just the animals of which St Francis was famously fond but earthly elements and the essentials of all life. In the hymn, these appear as the ‘burning sun with golden beam’. The ‘silver moon with softer gleam’ and the ‘fire so masterful and bright’. The rushing wind, the clouds that sail in Heaven and ‘Thou flowing water, pure and clear’. All owed their existence to God, and should therefore raise their voices in thanks to Him. There is much, much more profound spiritual insight, theological intelligence and appreciation of the Christian and Conservative understanding for environmental stewardship in this speech than has ever been expounded by an Environment Secretary. Certainly, others would have drawn on many of those eminent scholars, environmentalists and politicians who were name-checked, but Michael Gove is different: he expounds his personal philosophy – he explains what drives and inspires him – and if there’s one thing the contemporary Conservative Party sorely needs it is a secure and tested philosophy to mitigate if not obviate the increasingly widespread perception of an anchor-less and rudderless rabble of mutual loathing and dogmatic incompatibilities. For Michael Gove, the ethics of creation are inescapably bound by the ethics of the kingdom. His political theology is not off with the ‘sky fairy’ or steeped in aloof eschatological obscurity: he is concerned with the here and now; with how the starving might be fed; how bees might be saved; how lambs might be treated compassionately; how puppies might be better loved; how present progress might be faithful to the Creator’s vision of order and universal provision. This lecture is a true vision through the realisation of which people will literally cease to perish. There is, however, one slight niggle: there was far too much Pope Francis (and Pope John Paul II and Pope Benedict), and nowhere near enough Bishop of Chester. Some conservative-minded (and Conservative-leaning) Anglican leaders (there are one or two) have been formulating cogent theses on the environment for quite a few years. One might expect an Anglican Environment Secretary to name-check at least the Rt Rev’d Dr Peter Forster, whose interrogations of globalist pontifications, and probings of lefty pious platitudes, are invariably a delight to meditate upon.